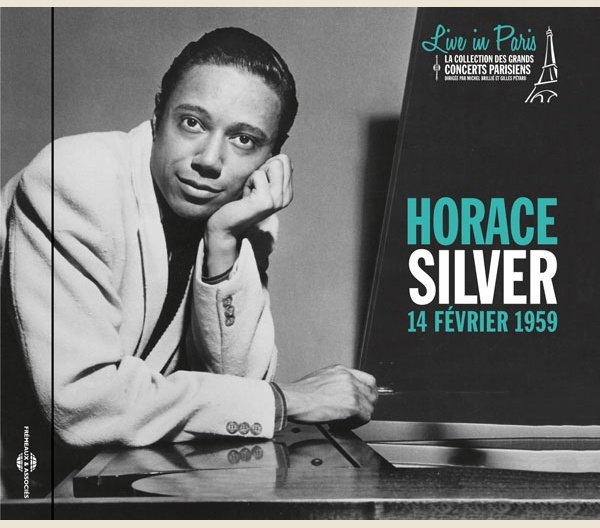 Jazz Classique - HORACE SILVER - LIVE IN PARIS 14 FEVRIER 1959 - FA5641 – Frémeaux & Associés. 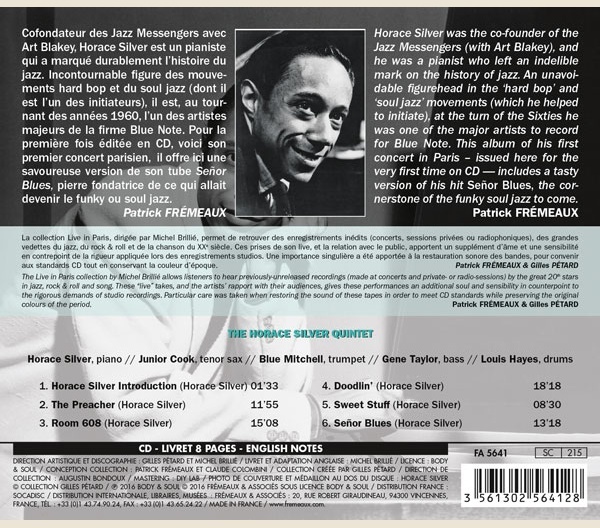 Cofondateur des Jazz Messengers avec Art Blakey, Horace Silver est un pianiste qui a marqué durablement l’histoire du jazz. Incontournable figure des mouvements hard bop et du soul jazz (dont il est l’un des initiateurs), il est, au tournant des années 1960, l’un des artistes majeurs de la firme Blue Note. Pour la première fois édité en CD, voici son premier concert parisien, il offre ici une savoureuse version de son tube Señor Blues, pierre fondatrice de ce qui allait devenir le funky ou soul jazz. La collection «Live in Paris», dirigée par Michel Brillié, permet de retrouver des enregistrements inédits (concerts, sessions privées ou radiophoniques), des grandes vedettes du jazz, du rock & roll et de la chanson du XXe siècle. Ces prises de son live et la relation avec le public apportent un supplément d’âme et une sensibilité en contrepoint à la rigueur appliquée lors des enregistrements studio. Une importance singulière a été apportée à la restauration sonore des bandes pour convenir aux standards CD tout en conservant la couleur d’époque. HORACE SILVER INTRODUCTION (HORACE SILVER) • THE PREACHER (HORACE SILVER) • ROOM 608 (HORACE SILVER) • DOODLIN’ (HORACE SILVER) • SWEET STUFF (HORACE SILVER) • SEÑOR BLUES (HORACE SILVER). « Funky, comment ça funky ? Tu prends un bain tous les jours ! » C’est le père d’Horace Silver qui réagit à un article de Downbeat, le magazine de jazz américain, qui vient de titrer son article sur le pianiste avec cet adjectif.1 Pour le pianiste/compositeur, qui rapporte cette anecdote dans son autobiographie2, cette réplique est assez amusante, compte tenu du style de vie du musicien. Elevé dans un cadre familial plutôt strict – son père est originaire des îles du Cap Vert – il aura toute sa vie une conduite rigoureuse : pas d’alcool, pas de drogues, pas de tabac, une nourriture équilibrée et vitaminée. A 20 ans, ses voisins l’appellent « Nature Boy », le tube de Nat King Cole du moment. Une vie quasi monacale, si l’on exclut la partie sentimentale, plus dense. Même si, comme il l’écrit, Horace Silver n’a eu qu’une seule vraie femme dans son existence : « Lady Music ». Donc, en ce mois de février 1959, on en est bien encore au… funk. Alors, soul, funk : à Horace le dernier mot, rapporté dans Jazz Hot du même mois : « Tout ce qu’il faut à un musicien c’est du soul (traduisez du funk). C’est la seule chose qui compte. Et en tant que bonhomme, tout ce que je lui demande, c’est d’être bien lavé… » Hygiène du corps et de l’âme, le prêcheur tient bien en main ses ouailles. Horace Silver et ses musiciens débarquent ce samedi 14 sous une douce météo parisienne. C’est sa première tournée européenne, dotée d’un planning pas trop lourd : le 14 à Paris, le 23 à Marseille, le 24 à Lyon, avec une escapade le 20 à San Remo, en Italie. Pendant son passage dans la capitale française, le quintet va jouer pour quelques dizaines de privilégiés serrés comme des harengs au célébrissime Club Saint Germain, rue Saint Benoit. 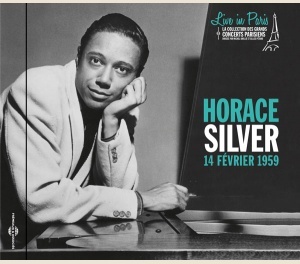 Juste avant de s’envoler pour la vieille Europe, Horace Silver a enregistré Finger Poppin’, son dernier album aux studios de Rudy Van Gelder dans le New Jersey, avec son tout nouveau quintet : Blue Mitchell (tp), Junior Cook (ts), Eugene Taylor (b), Louis Hayes (ds). Cette formation deviendra l’archétype des quintets du pianiste – celui qui aura la plus grande longévité aussi. « Sweet Stuff », le morceau qu’il interprète à l’Olympia pour la première fois en public, fait partie de ce nouvel opus. « Senor Blues » date de fin 56, et est, avec « Song for My Father », le morceau les plus vendu de Silver. Les deux titres sont une référence au père de Silver, John Tavares Silva, qui l’a élevé seul avec une grande tante après la mort de la mère d’Horace, quand il avait 9 ans. Composer, composer, the melody’s closer now. Look over your shoulder, don’t worry I’ll show you how. My spirit’s with you, leading you on. 1. Funky ou funk dénomme à l’origine une odeur de transpiration, d’origine sexuelle par exemple. Comme l’explique le chanteur Wilson Pickett dans l’histoire de la soul music, Nowhere to Run : « Avant, le mot funk désignait une activité que l’on faisait dans le noir et dans le plus simple appareil. » (Nowhere to Run, par Gerri Hirshey, traduction de Nicolas Guichard, Editions Rivages, 2013). C’est dans les années 50/60 que funky devient un mot d’argot des musiciens de jazz pour désigner ce style « charnel » qui amalgame blues, jazz, gospel. 2. Let’s Get to the Nitty Gritty, University of California Press, 2006. Les plupart des citations verbatim d’Horace Silver sont extraites de ce livre. 4. Traduction très édulcorée des propos de Miles, dont vous pouvez apprécier la réelle teneur dans la version anglaise du texte. 5. Compositeur, ta mélodie n’est plus très loin. Regarde par-dessus ton épaule, ne t’inquiète pas, je vais te montrer. Mon esprit est avec toi, qui te guide. Mon esprit est avec toi, alors vas-y, écris ta chanson. “Funky, what do you mean, funky? You take a bath everyday…”1 This is Horace Silver father’s reaction when he reads U.S. jazz monthly Downbeat’s story on his son the pianist. A rather amusing reply for the musician and composer, considering his own way of life. This is what he writes in his autobiographical book, Let’s Get to the Nitty-Gritty.2 Horace was raised in a somewhat strict family circle – his father being of Cape Verde extraction – and will abide by the rules all his life: no booze, no drugs, no smoking, along with health food and lots of vitamins. When he was around 20, his friendly neighbors nicknamed him “Nature Boy” after the hit song by Nat King Cole. Quite a monk-like life, with the exception of his much more active love life. Even though, as he himself writes, Horace Silver has had only one true love in his life, “Lady Music”. So, as of February 1959, we are still at the funk level. Well, soul or funk, let’s give the final word to Horace himself, speaking at the same time to Jazz Hot Magazine: “All it takes to a musician is to have soul (Jazz Hot translation: funk…) that’s all that matters. And, as a man, all I’ll ask from him is to be clean...” A good hygiene of the body and the mind, the preacher looks after his flock. This Saturday the 14th of February, it’s Valentine’s Day. In a few days, Fidel Castro will become prime minister of Cuba. Texas Instruments will create the first memory chip. Elvis Presley, who is serving in the U.S. Army in Germany, is getting ready for his next leave in Paris, including a visit to the Lido chorus line girls. Horace Silver and his men arrive in Paris under a pleasantly mild Parisian weather. This is their first European tour, with a rather light agenda: Paris on the 14th, then on to Marseille on the 23rd, Lyon on the 24th, and a sidestep to San Remo, Italy on the 20th. While the quintet is in Paris, it’s set to play also for several dozens of jammed lucky customers in the world-known Club Saint Germain. Just before flying off to Europe Horace Silver has recorded at Rudy Van Gelder’s New-Jersey studio his latest album, Finger Poppin’, with his brand new quintet: Blue Mitchell (tp), Junior Cook (ts), Eugene Taylor (b), Louis Hayes (ds). This group remains the epitome of all of Silver’s quintets – the longest lasting one as well. “Sweet Stuff”, the number that the musicians play for the first time at the Olympia, is part of this new album. “The Preacher” is probably the epitome of “Silverian” themes. The funny thing is that it was almost never recorded. When the owners of Blue Note Records, Alfred Lion and Frank Wolff, listened to the tune at an early rehearsal in 1955, they thought it sounded too much like Dixieland music, and they suggested to suppress it and jam a blues in its place. Horace Silver and Art Blakey so strongly insisted that “The Preacher” finally got recorded. “Senor Blues” is from late ’56, and, along with “Song for My Father”, Silvers’ best-selling tune. Both are in reference to Silver’s father, John Tavares Silva, who raised him on his own with a grandaunt after Horace’s mother died when he was 9. Silver enjoyed travelling a lot. Throughout the decade, he went all over the world, in countries such as Japan (an inspiration to “Tokyo Blues”) or Brazil, where he was invited by his friend, the pianist Sergio Mendes. When he returned from that trip having experienced the Rio Carnival, he was “haunted by the rhythm of bossa-nova” and composed “Song for My Father” – which in fact sounds more like the old Cape Verdean melodies that his dad used to play. Silver came back to Paris in October 1962, then in late ’68 for a European Tour sponsored by the U.S. Government. He then returned to the city only in 1995, when Dee Dee Bridgewater recorded a full album of his tunes “Love and Peace: A Tribute to Horace Silver”. The pianist plays on two of the tracks; one of them is “Song for My Father”. Look over your shoulder, don’t worry, I’ll show you how. My spirit’s with you, so go ahead and write your song. 2. By Horace Silver; University of California Press, 2006. Most of the verbatim mentioned here are excerpts from this book. 3. Les Années Jazz Magazine, Filipacchi Editions, 1994. Horace Silver was the co-founder of the Jazz Messengers (with Art Blakey), and he was a pianist who left an indelible mark on the history of jazz. An unavoidable figurehead in the ‘hard bop’ and ‘soul jazz’ movements (which he helped to initiate), at the turn of the Sixties he was one of the major artists to record for Blue Note. This album of his first concert in Paris – issued here for the very first time on CD — includes a tasty version of his hit Señor Blues, the cornerstone of the funky soul jazz to come. et licenciée à Frémeaux & Associés. Cofondateur des Jazz Messengers avec Art Blakey, Horace Silver est un pianiste qui a marqué durablement l’histoire du jazz. Incontournable figure des mouvements hard bop et du soul jazz (dont il est l’un des initiateurs), il est, au tournant des années 1960, l’un des artistes majeurs de la firme Blue Note. Pour la première fois éditée en CD, voici son premier concert parisien, il offre ici une savoureuse version de son tube Señor Blues, pierre fondatrice de ce qui allait devenir le funky ou soul jazz.